Should you use it? That's an educated decision you will have to make for yourself. American chefs have recently discovered mustard oil, and instead of mellowing it by first taking it to smoking point, they drizzle the raw oil over salads as a finishing touch. I'm sure it brings tears to the eyes of the unprepared. In deference to the mustard oil brigade, I made my Bengali dal with mustard oil and I don't think I can go back to using regular cooking oil for that recipe. I did want to try it with meat and my cravings led me to my favorite protein—lamb. When I found some local lamb, raised naturally and without antibiotics and hormones, and some not-so-local turnips, I knew I had to make Subz Gosht. I adapted this recipe from J. Inder Singh Kalra's Prashad, Cooking with Masters. The original recipe uses spinach but since I was looking for a variety of flavors, and my Indian grocer had luscious fenugreek leaves after a long time, I used those instead. Subz Gosht is a great way to get veggies into your meal without having to cook a separate vegetarian entrée. This dish is simple, flavorful and both, the turnips and fenugreek leaves, worked very well together with the lamb. Heat mustard oil to smoking point, then reduce heat to medium. Add tamalpatra or tejpatta and let it change color in the hot oil. Add red chile powder and turmeric powder. 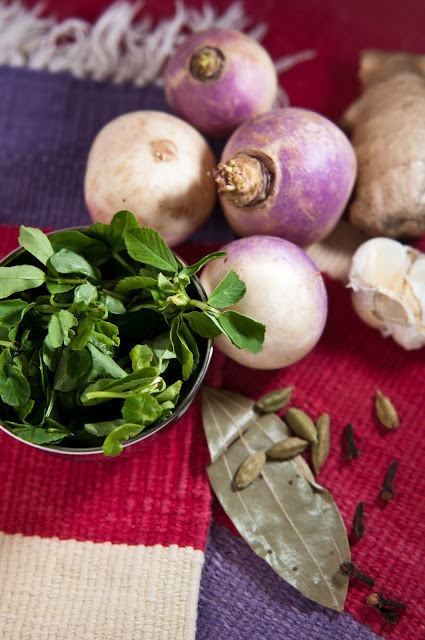 Add turnips and fenugreek leaves and mix well. Add lamb, followed by one cup of water. Bring to a boil, cover, reduce heat and simmer until meat is 3/4th cooked, about 10 minutes. To the pot, add tomatoes, bell peppers and about half cup of water. Cover and cook until lamb is almost done. Another 5-10 minutes. Mix the powdered cloves, cardamom and mace in a small bowl. 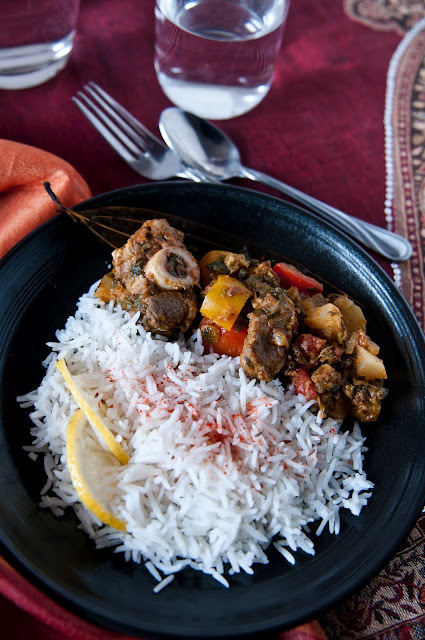 Transfer the cooked lamb and veggies to an oven-proof pan, if necessary, and sprinkle with powdered spices. Cover and seal the lid with foil to prevent steam from escaping. Heat the sealed pan in the oven for 15 minutes. Serve hot with rotis or over steamed white rice. Use a pan that can go from stovetop to oven. If you would rather not use mustard oil, you can substitute with any neutral cooking oil. If you do, don't bring it to smoking point. Instead, just heat it until it shimmers and add the onions. Apart from spinach which I substituted with methi, the original recipe uses 1/2 cup of fresh dill leaves but I didn't want anything to clash with the earthy, slightly bitter flavor of methi and therefore did not use any dill. For a variation on Subz Gosht, try Kulsum's Chukhandar Gosht which is a brilliant dark pink from beets. Manisha, you are wisest! So many lovely subz. I rarely cook with turnips, not exactly sure why. I can't wait to try this. Mustard oil is been used from times immemorial in north Indian pickles and vegetables like Kadduu and bhindi.Not to forget the awesome JHAAL (spicy flavor) you get when it is used in the Jhaal mooree (Puffed Rice Bhel) of Kolkata.So heres to happy eating!!! Cheers!!! I have never cooked mutton with any vegetables but potatoes. Looks very interresting. I used to think mustard oil was an acquired taste, but I was hooked the minute I made lau(ki) with kalonji in mustard oil, and have never looked back. It has no substitute! Not for human consumption? Seriously? Mustard oil is to Indian cuisine, what olive oil is to Mediterranean food. Of all the misguided, misinformed balderdash! My favorite dish to incorporate a healthy dose of mustard oil is aachari chicken-- lip-smacking good! Have to try your subz gosth (I just know I spelled that wrong, lol!) though I hate turnips. Huh never heard of mustard oil not suitabe for human consumption. I wonder why the FDA disapproves when you can consume mustard seeds?! Is it in the process of extracting the oil I wonder? Great post & btw one of the successful dishes in this Americanized DC Indian restaurant was this very dish. It is a great place to go out in any case but one of the closest to authentic dishes they produced is something similar to this. They called it Kashmiri lamb though. Great thoughtful post!! Yes we Bongs are still alive and kicking, even after years of eating food cooked with only mustard oil. The chicken and the dal and the fish and the raw sprinkle on aloo bhaate and begun pora, all tastes better with the M oil. Now I am def. coming over or rather eagerly looking forward. The oil, the delicious looking bowl and the bed. And may be a massage too with the not edible mustard oil? what say? ready for me? just remembered that I used to be addicted to how the mutton smelled (while marinating), when maa marinated the mutton with ginger garlic paste, a little yogurt and some mustard oil.. try it!! Thank you for this post, Manisha. mustard oil has no substitute. I've loved it since I cooked Anita's taher. I still yearn for it from time to time. And fish/meat definitely tastes better with mustard oil. The comments (above) about marinating mutton with mustard oil sound like a great idea. Well, after your previous post I was planning to issue a similar PIA on the beautiful mustard oil, perhaps one of the most healthiest of oils! Since it is not a neutral oil, substituting it with others does mean a loss of traditional flavour. You are right about the flavour in mutsch . . . the notes are unmistakable. In fact, in dishes where we use no turmeric it even adds a hint of colour. I cook meat with spinach, with turnips, with kohl rabi, even cabbage, but haven't combined them. Love what happens to veggies when they are cooked with meat. maybe, Manisha, you could send the FDA some mustard oil to pour over their troubled waters, if i could be forgiven for massacring an old saying/ or words of a song ?! by the way, your Indian Cricket team is still here, just, but Tendulkar has failed to get his cherished 100th first-class century. big selection challenges face India ! some GODS may not survive !cheers, john k.
We don't have mustard oil here, and how I wish we did! I did however make the Bengali Dal recipe without it...and it's my new favourite dal recipe!! The lemon juice at the end really seals the deal. Kulsum, keep saying nice things to me! I like it! I'm not sure either why turnips aren't popular. I really like them a lot but then I like dandelion greens, too! The turnips absorb all the flavors and taste excellent. Let me know what you think! Gaurav, thanks! And, yes! I love Indian pickles with mustard oil. I have not been to Kolkata yet. When I fix that, I am going to have that awesome jhaal mooree you speak of, too! BM, I was definitely thinking of you when I wrote this post ;-D The vegetables cook in the juices of the meat and take on a lovely flavor. Try it! I am going to try marinating lamb with some mustard oil the next time. notyet, I still have to try it in all those dishes. Thanks for the suggestions! GB, follow the link and you will see that it is supposed to have large concentrations of urecic acid that affected rats adversely. But we're not rats, you know! As for achari chicken - I haven't made that in ages. It's delicious! Shulie, the concentration is much higher in the oil besides we consume a lot less of the seeds than we would oil. According to Kalra, this dish has its roots in Avadh or what is Lucknow in the state of Uttar Pradesh today. But who knows why restaurants in the US call their dishes what they do! Joyce, it's amazing how the oil makes such a difference! I'm glad you agree with me, too! But I had to use the real thing because that blend really has no flavor. I'm always grateful for BM and Soma and their knowledge of Bengali cooking. That's a tip I am going to try out, too! Anita, PSA. PIA is an airline, among a whole bunch of other things. ;-D Sorry! I couldn't resist! Hee! But you should go ahead and write that post anyway. You will add much more value to the argument in favor of mustard oil than I ever could. I barely even scratched the surface with this post. John, ha! You can be forgiven only of you keep the Indian cricket team and, as a fair exchange, send your fabulous players to India instead! Anna, Golden Ladle Award! Ha! Ha! I like the sound of that! I humbly accept only because I think that the Bengali Dal is really amazing. I could eat it every single day and not tire of it. You are awesome for trying it out and letting me know. And, yes, you definitely need the lemon juice at the end. It rounds off all the flavors really well. Now we just need to figure out how to get you some mustard oil so you can also experience what we are talking about. I wonder if you could order a small bottle online? Or perhaps ask your local Indian store if they can get hold of some for you? I was saying . . .Public Interest Announcement! :-) PSA - same thing but the correct term for the NPR announcement, I suppose. Mustard oil is controversial I agree, but like you said it has been used for ages for cooking and also pickling. I love to use it for cooking certain vegetable and dals and cannot substitute it with anything else. Although I don't eat meat this recipe has my mouth watering! Read Wiki's article on mustard oil- extra info, if you haven't already. Very nice all-in-one dish. I've seen recipes for this before, but have never made it; your pics are tempting me! Now I understand why when I bought a new jar of Mustard Oil, it was labelled "For External Use Only." Yeah. And coconut oil is "full of cholesterol." It isn't--but you can't tell some doctors that. I'm beginning to realise that everything the media told us about food in the 80s, 90s and 00's--was totally wrong.